The Fuzzy Pineapple Arts & Crafts Festival is looking for artists to participate in their event at the North Florida Fairgrounds, on March 24, 2018, from 10-7pm. Showcase your talents in a live performance on-stage, perform a demonstration, teach a workshop, paint a body, or showcase your wares in the fashion show. Explain your work, creative processes and what drives you to create on-stage! Sell your art, handcrafted wares, plants, food, and more at the festival and/or share a booth with other artists. Enter the all day art competition, and watch your art bloom with the help of other artists. 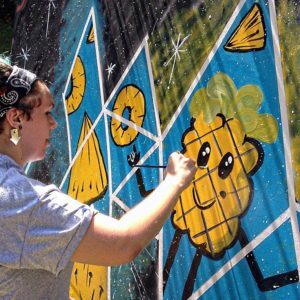 Make your own solo art throughout the festival with installations, incorporating the theme “Pineapple Party.” This is juried and prizes include up to $100 in cash, gift cards, art supplies, fuzzy pineapple items, and/or a free 10×10 booth for next year. There will be a “Speed Art Contest” wherein artists can participate in a 20-minute, speed art contest on stage and win fuzzy pineapple packages, gift cards, and prizes. Artists can teach a class or facilitate a demo about their products or services onstage, or in a workshop booth. There will also be opportunities for photographers and videographers to show their short films, and secure a free booth in exchange for recording the memories at the event. We are using our crowdfunding campaign to sponsor twenty student artists with a table, tent, chairs, and a sign. 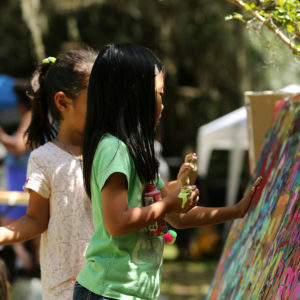 Student organizations that host an activity booth or station can network, sell, and showcase their art for free, as long as they plan to stay for the entire festival. The person or group who brings in the largest amount of people to the festival will win $500. All parties will be noted at the information booth upon entering the festival.